Every year as April 24th approaches, there is a feeling of anticipation, that the once inevitable recognition will finally be acknowledged. Presidents upon Presidents and the same speech after speech. We all know it was a tragedy, but our fight is much more than a simple tragedy. Every year it seems we gain hope that the word “genocide” will echo from the most important figure in world politics. Do our hopes feel mislead every April? Or perhaps we fail to look further into the realm of politics that blinds the truth. The United States is called the “leader of the free world” for a reason. Their decisions affect even the smallest of nations. In order to understand our disappointment, we must understand the unfortunate truth of politics. Being a President and a Presidential candidate are two different positions. The argument that politicians would say anything to be elected has become somewhat invalid because it seems like an accepted practice. After all, would ha politician be a politician if they kept all their promises? We’ve all seen the YouTube video of Senator Barack Obama say without hesitation that “the Armenian genocide is not an allegation, a personal opinion, or a point of view, but rather a widely documented fact.” So why has he (like previous Presidents) failed to say the same during his time in the oval office? In 1981, President Ronald Reagan was an exception when he did the unthinkable and mentioned “the genocide of the Armenians” during his speech on the Holocaust. But does a President’s personal recognition really matter? In the end, the United States still had not recognized the genocide, nothing was accomplished, and the Armenian struggle is still ongoing to this day. Presidents have their own opinions; Obama even said during a speech that “his views still have not changed.” The real gateway to genocide recognition is through the lawmakers. Representatives and Senators, who on one hand have stated their personal recognition of genocide, are cautious to express it for political reasons. Whether the President is a Republican or a Democrat, the pattern is the same. Numerous bills have gone through the process of becoming a law, but all have found their fair share of roadblocks. To further understand the reluctance of the United States to recognize the Armenian Genocide, we must first realize the importance of Turkey. One of the fastest growing economies in the world, and whether we are willing to accept it or not, a very important ally to the United States. Being a strong member of NATO, Turkey holds strong influence from its geographical position. Being the bridge for Europe and Asia, its influence is vast from their strong Western ties, to its even more powerful position (arguably) as leader of the Islamic world. Though their government is more secular than Islamic, they are an economic benchmark for the Middle East. Turkey’s importance as an ally is much more than just a trading partner. The United States needs Turkey in order to safely send aid and equipment to troops in the Middle East. The Incirlik Air Base in Turkey is arguably the United States’ most important geographical air base due to its strategic location. And as volatile as the Middle East is, Turkey is the perfect location for an ally base where Syria, Iran, and other threatening nations are a stone’s throw away. The NATO mission in Libya that liberated the people from Muhamar Gadhafi, was accomplished without a single US troop on the ground, but rather air strikes. The jets used for these missions were based in Incirlik. Turkey is good at using their strengths as threats. Threatening the US that they will take away the privileges Turkey has handed to them, as an ally and partner. But what the United States needs to realize is that they are lacking audacity. The United States needs to realize that every trading partner, military ally, or political partner out in the world is one of many. Who wouldn’t step up for the “leaders of the free world?” History tells us one thing; that when a country accepts the Armenian Genocide, Turkish nationalism kicks into top gear. The all so important partner in Turkey all of a sudden shows their true red egocentric colours. What do Belgium, Canada, France, Greece, Italy, Lebanon, Netherlands, Russia, Slovakia, Sweden, Switzerland, Uruguay, etc. all have in common? They have all recognized the Armenian Genocide, and they all have relations with Turkey. 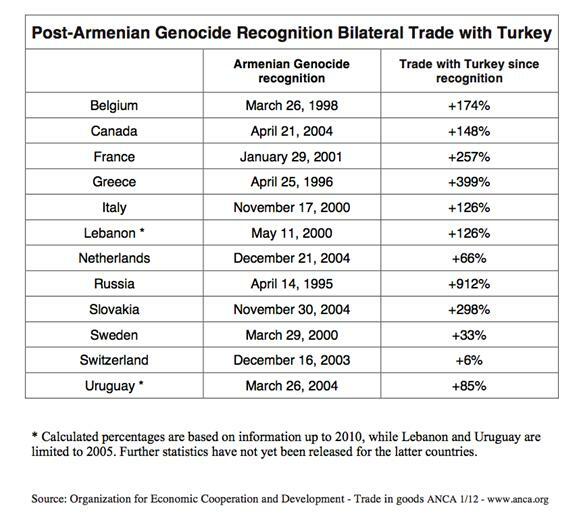 In fact, a recent study clearly outlines that countries that have recognized the Armenian Genocide have seen increases in trade with Turkey from the time they acknowledged the genocide, until 2010 (Organization for Economic Cooperation and Development). France for example, which recognized the genocide in 2001, has seen a 257% increase in trade with Turkey since that time. Russia which recognized the genocide in 1995, has seen a 912% increase. What history articulates is that truth and politics can co-exist. Because of France’s ongoing push to fine and imprison Armenian Genocide deniers, Turkey has once again turned a cold shoulder, and derailed relations for the time being. Hypothetically, if Turkey had done the same with the United States and stopped relations, who would falter? Economically speaking, Turkey imports $14.6 billion USD worth of goods from the United States annually, whereas, the United States imports $5.2 billion USD. That trading partnership has lead them in becoming important partners in NATO, where Turkey has become a peacemaking mediator for the Islamic world. For Turkey, in order to grow its economy, admission into the European Union is a huge step. And if they lose the support of the United States, then they can kiss the EU goodbye. France will never let Turkey into the EU in the first place. Yes, Turkey will get frustrated. Yes, Turkey will pull their ambassador. Yes, Turkey will threaten sanctions. But in the end, Turkey needs the United States more than the United States needs Turkey. The fact that the Armenian Genocide happened is not something that can be debated. Most political figures know the truth about the events of 1915 and aren’t debating the existence of an annihilation. What’s up for debate is whether or not recognizing the Armenian Genocide will benefit the United States. Sadly, for almost 100 years, it seems like it’s an event not worth recognizing even though the truth is so evident. Now with the war in Iraq complete, and the war in Afghanistan minimized, the United States has become a little less reliant on Turkey’s air space and the strategic location of their air base. Perhaps now the United States can see a window of opportunity? Remember, the more volatile the Middle East, the more important Turkey becomes, the less likely for genocide recognition in the United States. Let’s just hope Syria and Iran can cool their tempers.